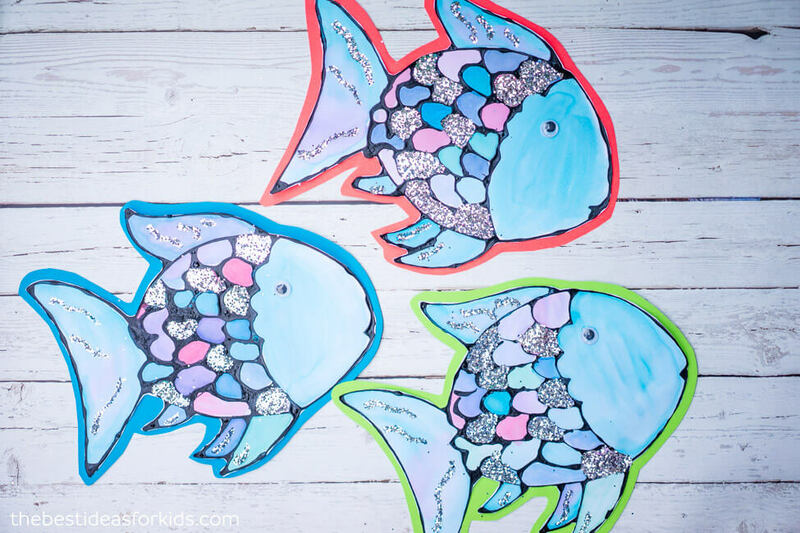 We absolutely adore the book the Rainbow Fish by Marcus Pfister and we have the best Rainbow Fish Craft to go with the book! If your child hasn’t read the rainbow fish before, I recommend you watch this live reading of it which includes animation. 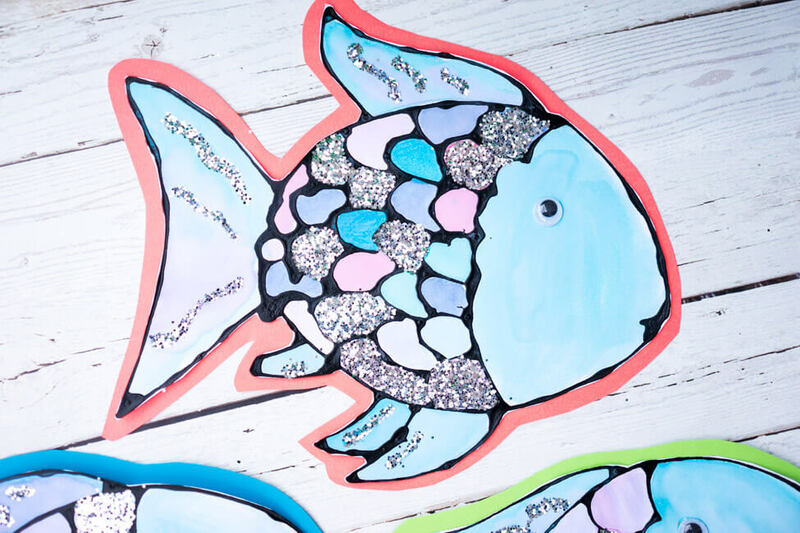 There are so many Rainbow fish crafts but we haven’t seen one done with black glue yet. 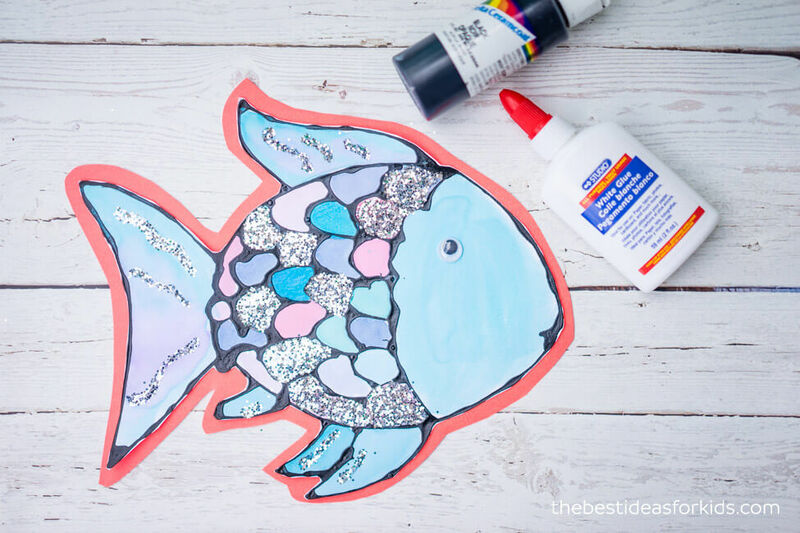 So this Rainbow fish craft is made with black glue! What is black glue? Well, it’s exactly what it sounds like, glue that is tinted black. You can skip down below for more details on how to make black glue. 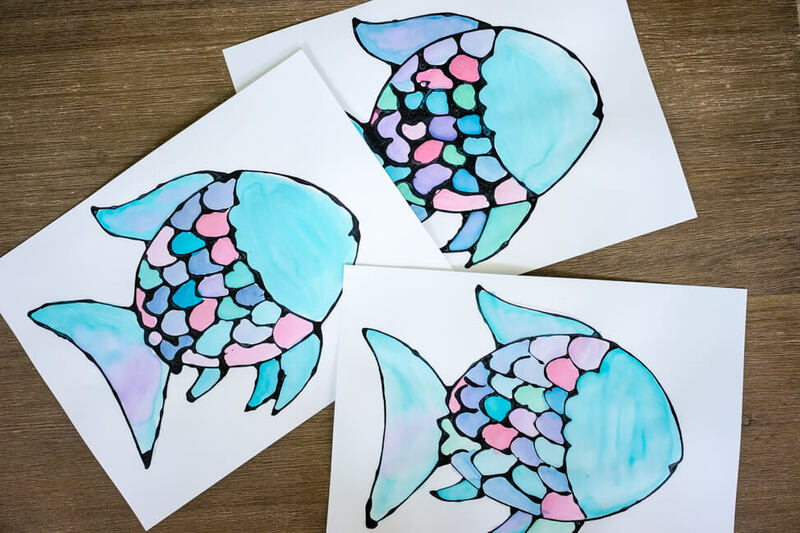 Each rainbow fish will be unique and would make a brilliant board of fish to put on display. 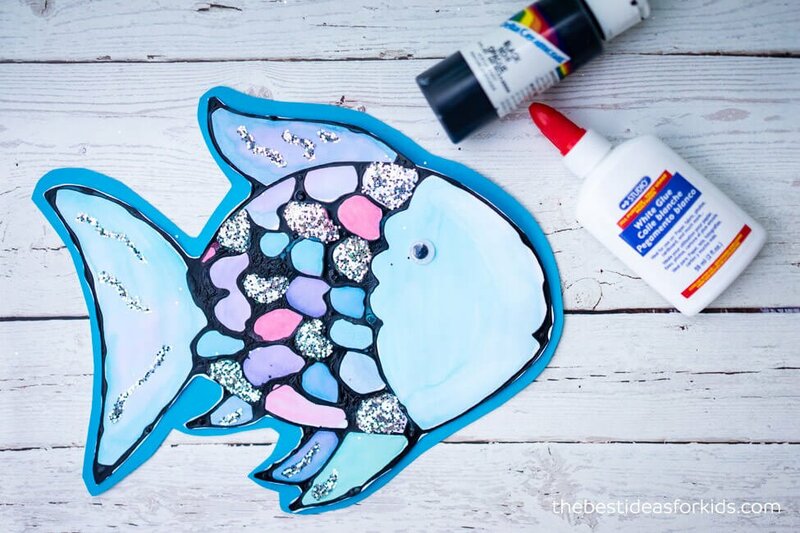 The book is well known for its morals about the value of being an individual so this craft is perfect since each rainbow fish will be unique. In order to make black glue, it’s pretty simple. You just mix acrylic black paint with regular white glue. But the key is that you need to really mix it. What we did is added black glue a little at a time until you get the color you’re looking for. It will probably end up being close to 1/4 black paint and 3/4 white glue. You can use a paintbrush to stir in the bottle to make sure to mix it up properly. You can also shake the bottle to spread the paint around. 2. Now trace your Rainbow Fish pattern. 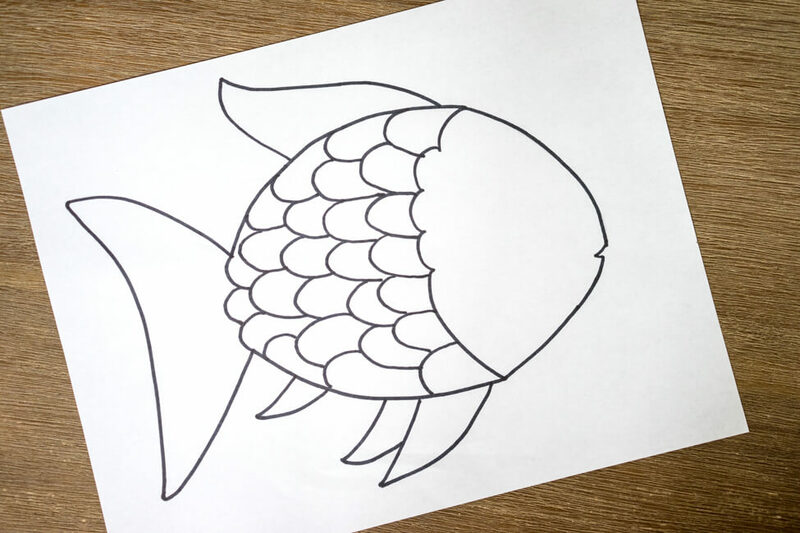 Print off the free Rainbow Fish Template. 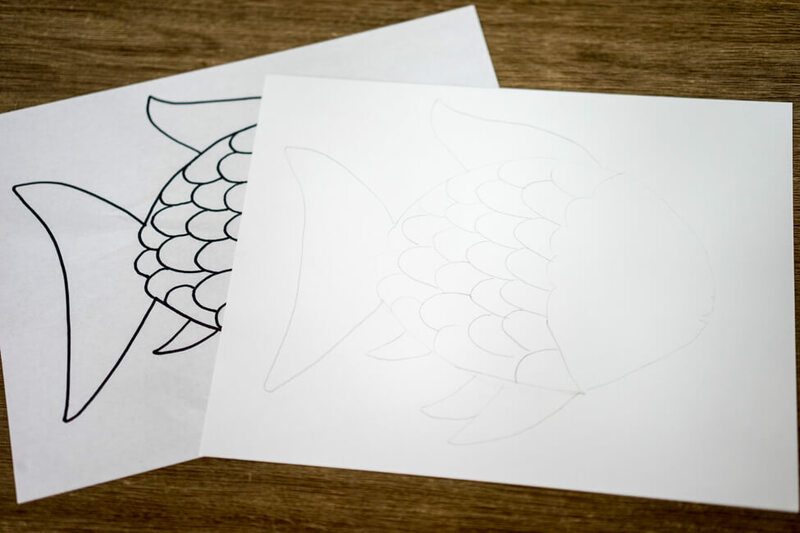 Using a piece of paper on top of the template, hold both pages up to a window and trace the fish in light pencil onto your cardstock paper. 3. Apply your black glue. Now that you have your template drawn out. 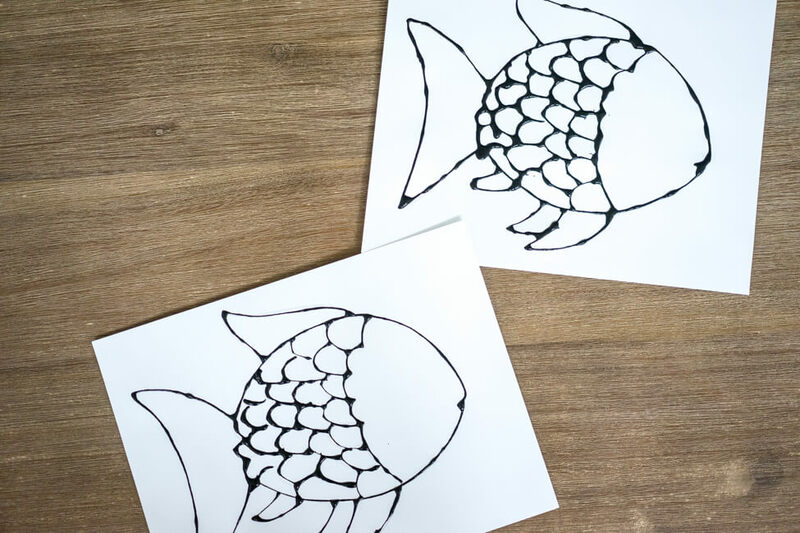 Use your black glue to outline your rainbow fish. Try to move quickly but smoothly to avoid pooling the black glue. If you go in a straight line from line to line you won’t get pooling in between the lines. It’s okay if you do though! It’s part of the effect and it will still look great! 4. Let your black glue dry overnight. Once your black glue is dry, it’s time to paint! 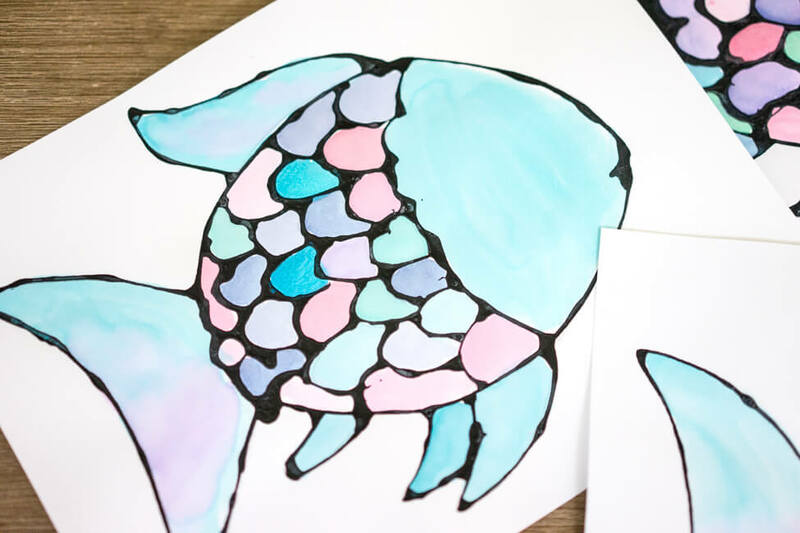 Using watercolors, paint the rainbow fish using a mix of different purple, pink, red, greens and blues! 5. Once your watercolor painting is dry, apply your glitter. Apply glitter to different scales on the fish. Fill the scale with glue and then shake your glitter on top. Shake off any excess glitter and you can put it back in your glitter bottle. 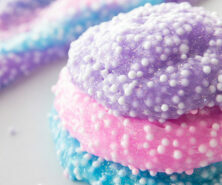 Pick and choose different scales to decorate. 6. Glue your fish to a colored background and cut out. To make your fish “pop” more, we glued it to different colored backgrounds. 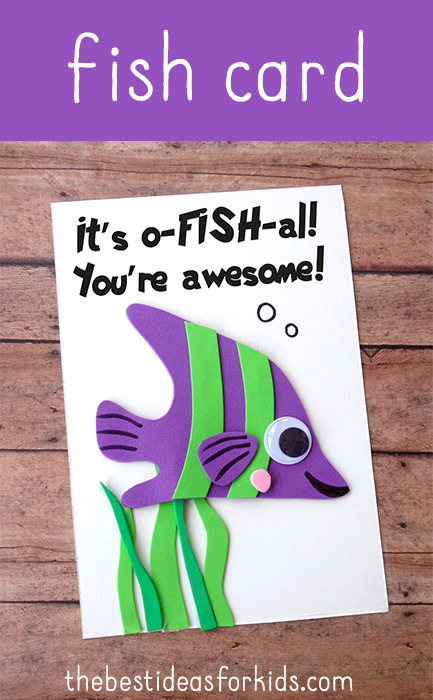 Looking for more fun fish crafts? 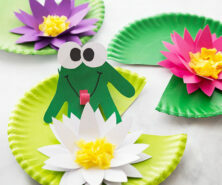 Be sure to also look at these fun fish crafts for kids! 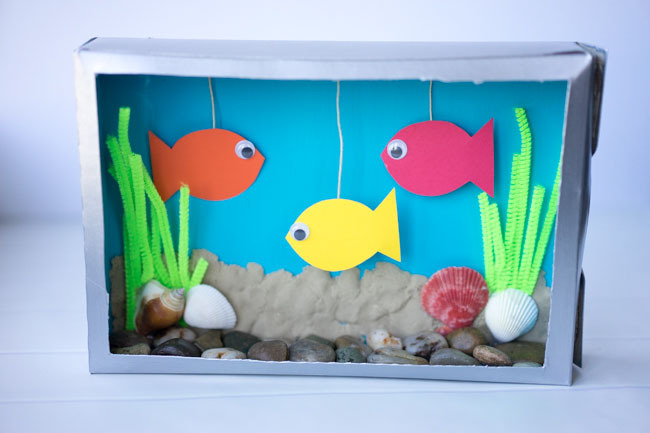 Cereal Box Aquarium – this is such a fun way to upcycle a cereal box! 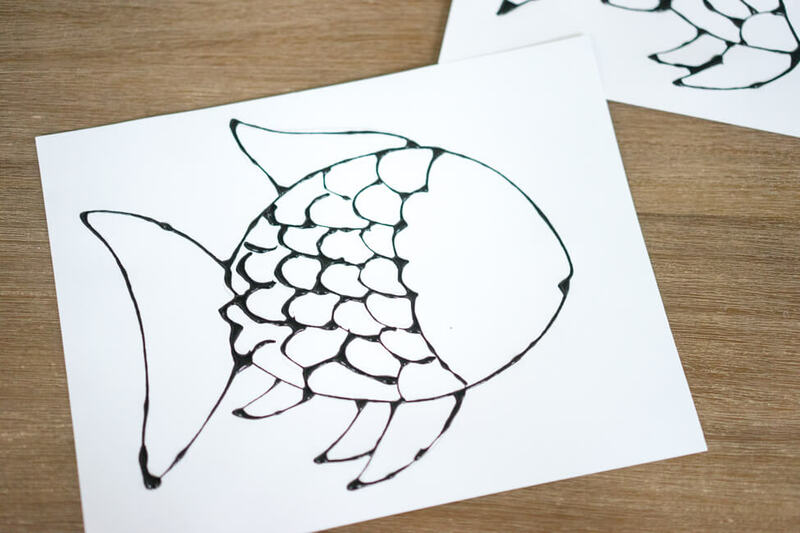 This Fish Handprint Card is so cute! You could make this for Father’s Day or for a birthday gift. 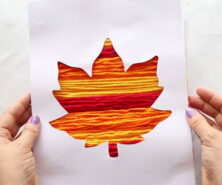 This is a fun process art activity for kids! 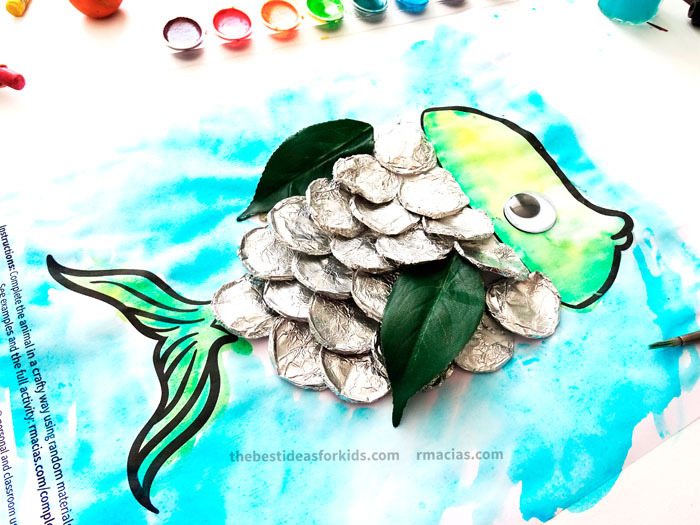 Have your kids complete this fish picture along with other animals with all sorts of different materials. 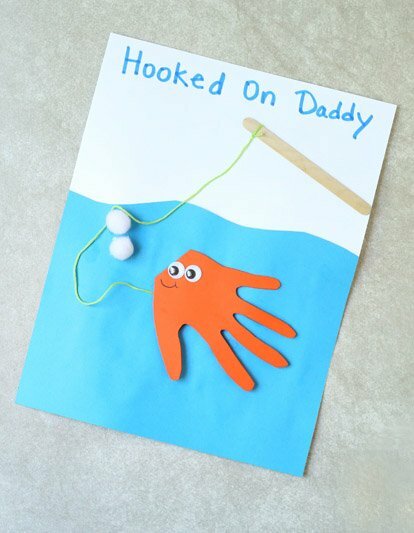 This fish craft for kids is a perfect card idea for a birthday or Father’s Day! Thank you very much for your beautiful lessons. My daughter loves them so much. They are helpful.